Pine Island Florida’s Fire Department held a ceremony celebrating the completion of the mural painted on the east wall of the training tower. The event took place on Saturday, March 7, at the Matlacha/Pine Island Fire Department. Mel Meo and Cliff Schultheis were the local artists commissioned for the job. 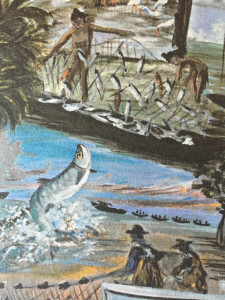 The mural is named 7,000 years of fishing Pine Island Florida. The Calusa Indians are painted at the top with local fishermen present today, completing the bottom. You can purchase limited issue prints of the mural at Meo’s shop located behind the Subway at the 4-way stop at the Center. The Matlacha/Pine Island Fire Department provides basic life support, rescue service, fire inspections, public fire education, and boat operations. The Fire Control District protects approximately 45 square miles. The geographical areas they provide include: Bokeelia, Pineland, Pine Island Center, St. James City, Matlacha, Matlacha Isles, and Cape Royal. Administrative offices are located at Station 1, which is at the Center. Station 1’s address is 5700 Pine Island Road Bokeelia, FL 33922 and the non-emergency number is (239) 283-0030. The Prevention Division of the Matlacha/Pine Island Fire Control District is committed to providing superior quality preventive fire service to those who live, work, and invest in the District. Matlacha/Pine Island Fire Control District protects lives and property from fire and injury through continuous effort and integrity of service in every section within the Division. They energetically contribute to the community, serve as positive examples, and make every effort to efficiently and practically make the most of all the essential resources available in order to provide a safe environment for the citizens and emergency responders.